Klaveness “Klara” boot is based on tradition and history. 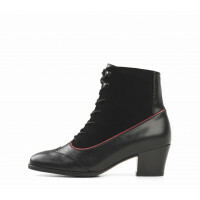 In the past, it was very common to use laced boots for bunad and folklore costumes. "Klara" is made in a high-quality leather combination upper enriched with fine details, and a leather lining for enhanced breathability. 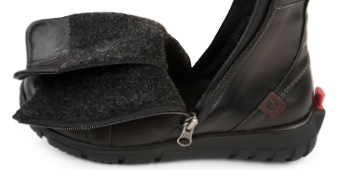 This style has removable footbeds and a neolite sole, suitable for outdoor use under Norwegian weather conditions. Chevreau :: Chevreau is produced from goat hide, and its surface is soft, smooth and supple. 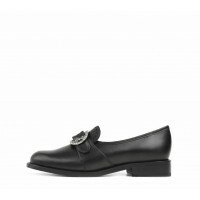 It moulds perfectly to the shape of the foot and remains quite stable in form. Chevreau velour :: Chevreau velour is produced from goat hide, and its surface is soft with a velvety touch. Leather :: This natural material confers a general feeling of well-being, absorbs moisture and has a temperature-regulating effect. 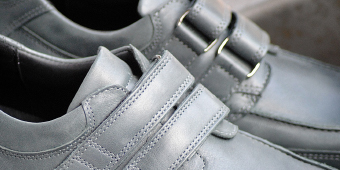 Gentle on the skin, smooth leather lining can help prevent injuries caused by friction against stitches. On some selected styles, Klaveness offers three different widths based on the same last - narrow, standard and extra wide. These volume options can be used to address as much customization needs as possible, while keeping the original shape and features of the style. A range of standard soles designed to match each of these different shapes is also provided. Bellows tongue is a wide folding tongue that is attached at both the top and the sides of the shoe upper. 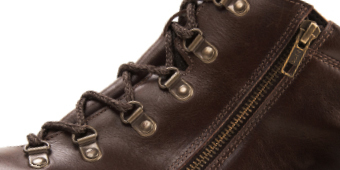 Mostly used in trekking footwear, it provides protection from snow, water and sand, whilst increases insulation. 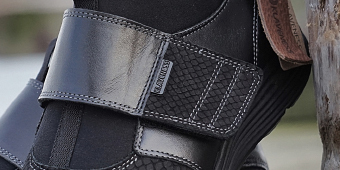 A set of Velcro straps is the preferred fastening system for most footwear, especially for its simplicity of use by children and the elderly. To broaden the extension of adjustment, Klaveness offers extra-long Velcro straps that are marked with the options for cutting in different lengths. 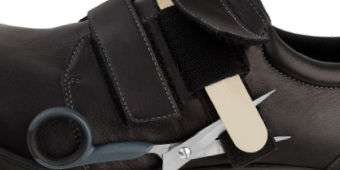 This allows the user to cut the excess strap so it's adjusted in a controlled way. For extra closure and adjustability, two sets of opposite fastening return straps are used. This solution also widens the opening, aids putting on and taking out the shoes/boots. Reinforced closure and optimised adjustment are obtained by returning the strap through a loop, acting as a pulley system (thus gaining a mechanical advantage), and further absorbing force in friction around the tight bend. 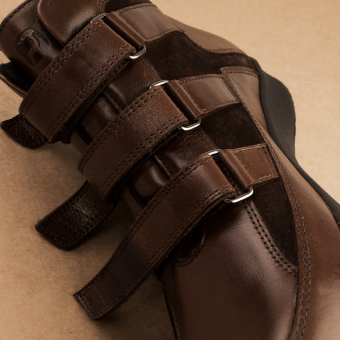 Dual-side zipper closure adds functionality and warrants a wide opening to footwear, for easy put on and take off. Klaveness has developed a solution to prevent slipping accidents - a major problem, especially among older people. The ice sole system is as simple as ingenious. 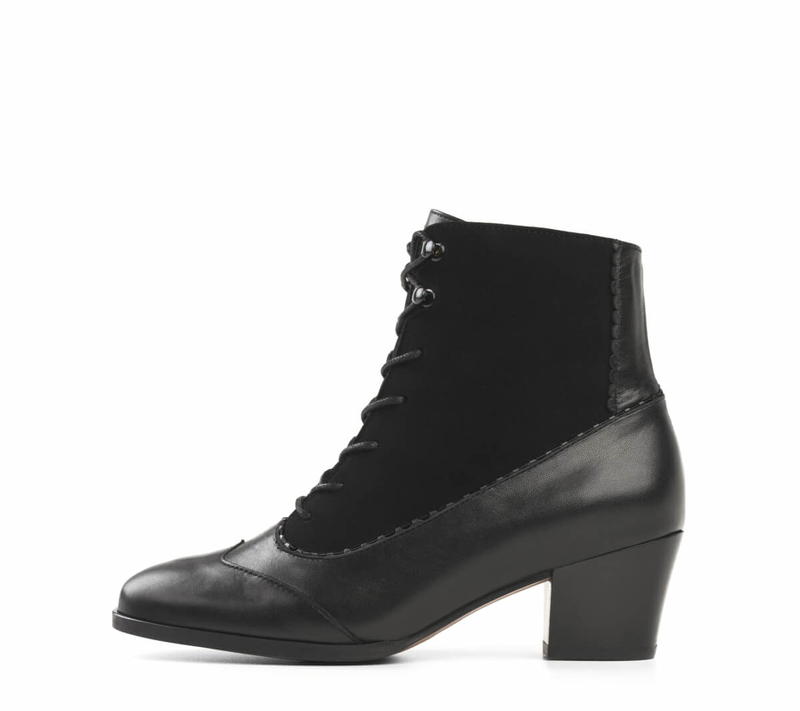 It's an easily twistable piece built into the bottom of the sole. 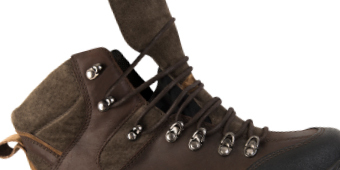 If you need increased grip when walking on icy surfaces just twist it to the metal studs side; for indoor walking versatility just turn it to the opposite side. :: EASY TO USE: JUST TWIST IT WHEN YOU NEED THE GRIP! The lightest cutting edge components are used in Klaveness range of soles. Shoes equipped with these have their weight substantially reduced and are normally good options for summer and outdoor activities as well as day-to-day use. 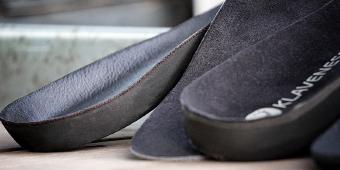 This patented system developed entirely by Klaveness is available in a wide range of Medical Stock Shoes and can also be used in orthopaedic styles. To broaden the extension of adjustment, Klaveness offers extra-long Velcro straps that are meant to be cut to the desired length. After this adjustment is set, the hidden unused part of the strap must be cut off, resulting in nicely finished ending seams. This is an adjustment for customised foot orthotics fitting. Some customizations require more volume than usual and more space is needed to accommodate correctional foot orthotics. 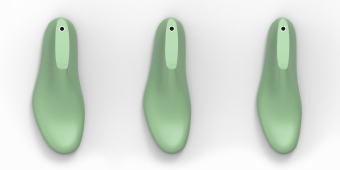 Although being designed to meet special foot orthotic requirements, it can be used to fit a more voluminous foot. 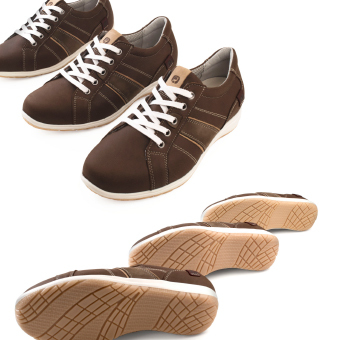 Footbeds play an important role to create comfortable shoes, as they provide cushion comfort and moisture management. Removable footbeds are particularly beneficial for those who need customized foot orthotics. Additionally, they can be detached for airing and cleaning, and easily be replaced with a new pair when they start to wear out, extending the life of your footwear. This feature ads functionality to the velcro strap by returning the strap through a metallic loop. This loop acts as a pulley system, absorbing force in friction around the tight bend, resulting in reinforced closure and optimized adjustment. 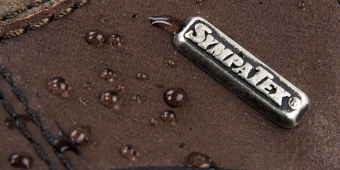 Waterproof ensures that your feet stay dry, warm and comfortable in wet or icy conditions. Consisting of two tracks of metal teeth that interlock via a central pulley, a zipper is always a good solution for those who have difficulties on fastening the footwear. Zippers simplify and speed up taking off and putting on shoes, and they allow the same fit each time you put them on. This is a reel and steel lace cable system used to tighten shoes with the turn of a lightweight dial. This easy one-handed adjustment system is durable and secure, and delivers a smooth, even closure without pressure points. 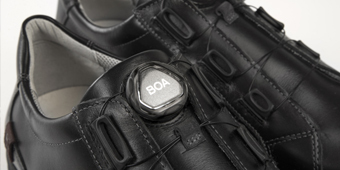 Each click of the Boa dial equates to one millimetre of tension adjustment, so it provides a micro-adjustable fit. 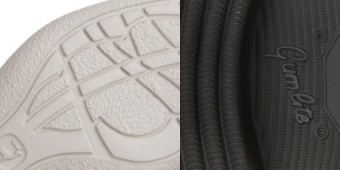 With the reel locked in place along with the stretch-free laces, the fit stays consistent all day long. 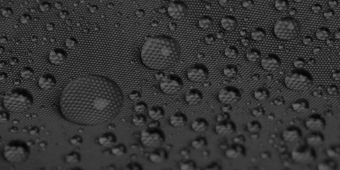 SympaTex® is a fabric that is branded as 100% waterproof and is made or licensed by SympaTex Technologies GmbH. The fabric features a waterproof, windproof and breathable membrane that is laminated to fabrics either on its inner surface or sandwiched between two fabric layers ("3 layer laminate"). The latter system offers greater durability, by better protecting the integrity of the SympaTex layer from abrasion to both. The large volume of the toe cap reduces the risk of pressure points and lesions in the front of the foot. 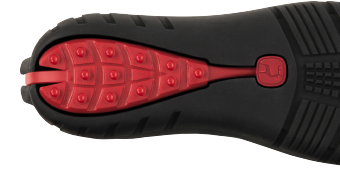 100% metal-free toe cap, fully lined with soft, comfortable padding ensuring increased wearer comfort when kneeling and during impacts. Safety footwear marked with the ESD symbol meets the ESD specification with a leakage resistance of less than 35 megaohms. SRC is currently the top rating for slip resistance under the EN ISO 20345:2011 standard. 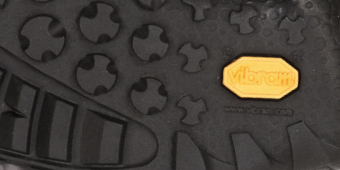 Safety footwear marked with this symbol have been produced in sizes 35-40 using a last which mimics the contours of the female foot. Combines expertise in research and product development with the use of intelligent materials and technologies to develop climate-optimised safety footwear.